NEW YORK (CNN) -- The crown of the Statue of Liberty will re-open to tourists on July 4, the Interior Department said Friday. The Statue of Liberty welcomes visitors, immigrants, and returning Americans. The crown was closed after the terrorist attacks of September 11, 2001, for safety and security reasons. The National Park Service closed the attraction amid worries that it would be difficult for visitors to evacuate quickly in the event of an emergency. Visitors must climb a narrow 168-step double-helix spiral staircase to get to the crown. The federal government planned to give "America a special gift" by re-opening the crown, Interior Secretary Ken Salazar said. "We are once again inviting the public to celebrate our great nation and the hope and opportunity it symbolizes by climbing to Lady Liberty's crown for a unique view of New York Harbor, where the forebears of millions of American families first saw the world," he said in a statement. Access to the crown will be limited to 10 people at a time, guided by a National Park Service ranger. "We cannot eliminate all the risk of climbing to the crown, but we are taking steps to make it safer," Salazar said. The measures include raising the handrails on the spiral staircase and stationing rangers throughout the Statue to help visitors. The Statue of Liberty will be open for the next two years, then closed again for "work on a long-term solution that will improve safety and security permanently," according to the U.S. Department of the Interior. 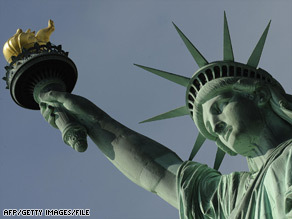 A gift from France to the United States, the Statue of Liberty was dedicated in 1886, designated as a National Monument in 1924 and restored for its centennial on July 4, 1986. It stands just across New York Harbor from where the Twin Towers stood.